Ireland cemented their status as the team to beat at next year's World Cup with a first win over New Zealand on home soil, sending supporters and media into a collective frenzy on Sunday. 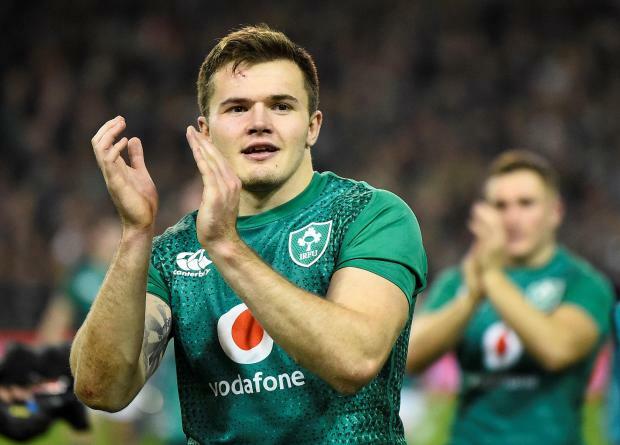 Jacob Stockdale's brilliant chip-and-gather try was decisive in a 16-9 victory at the Aviva Stadium on Saturday, with the rest of Ireland's points coming from the boot of Johnny Sexton. Just two years after claiming the All Blacks' scalp for the first time at Soldier Field in Chicago, Joe Schmidt's side produced a defensive masterclass to keep the reigning world champions at bay. "On top of the world," declared the Sunday Telegraph with a picture of Irish players celebrating Stockdale's rampaging try, while the Sunday Independent hailed the team as the "mightiest men that ever wore green". The Irish Sun hailed the group as "History Boys", saluting the team's relentless determination, while the Sunday Independent's sports page celebrated the "Green Giants". "Ireland can now claim to be the best team in the world after producing a stunning performance that was brave, creative and relentless," said the NZ Herald's Gregor Paul. "They deserved the win and with it, they deserve to be seen as world rugby's best team even if the rankings don't agree." Ireland president Michael D. Higgins wrote to the Irish Rugby Football Union and captain Rory Best, thanking the players and coaches "for an evening that will live long in the memory of everyone who loves Irish sport". Minister for Transport, Tourism and Sport Shane Ross also praised the team for achieving a "monumental triumph". Prime minister Leo Varadkar had moved his televised address at the governing Fine Gael party's annual conference from its usual prime time evening slot to 1730 local time on Saturday so it did not clash with the match. "What a game! We may be a small country but sometimes we can be the best in the world," he wrote on Twitter.